Alfajores. That would be Moon Pie, only smaller. These chocolate covered double-decker cookies with assorted fillings are everywhere. Buy them in bulk if you want. In places where Argentines go on vacation every other shop is an alfajores shop. Agua con o sin gas. Water, with or without carbonation. In a bottle, and not from a tap. This is a good thing. Apio. Celery, available once a week in vegetable stands and not served with peanut butter. Actually, not served anywhere. Asado. Grilled meats, available everywhere and served as a variety of cuts including organ meats you cannot name. Café con leche. Espresso with hot milk. A dietary staple. Casa de Te. House of Tea, although this is unlikely to be true in any aesthetic sense. If they own a teabag it is casa de te. Casero. Homemade, or, alternately, artesanal (handmade). This is especially good when referring to empanadas. Dulce. Anything sweet. As opposed to salado (see below). Dulce de leche. Milk that’s sweet. Dark, condensed, and caramelized. Served with toast or bread of any sort. Empanada. Inexpensive pastries filled with beef, chicken, ham, cheese, onion, chocolate, vegetables, tuna, fruit and/or dulce de leche. Ensalada completo. Lettuce with tomato, carrots, onion and possibly hard-boiled eggs and/or beets. Jamon y queso. Ham and cheese, served on white bread without crust. Argentina was originally settled by small children who would not eat the crust. Nafta. North American Free Trade Agreement, to which Argentina is not a signatory. Also refers to gasoline, sometimes available in service stations, although café con leche is more likely. 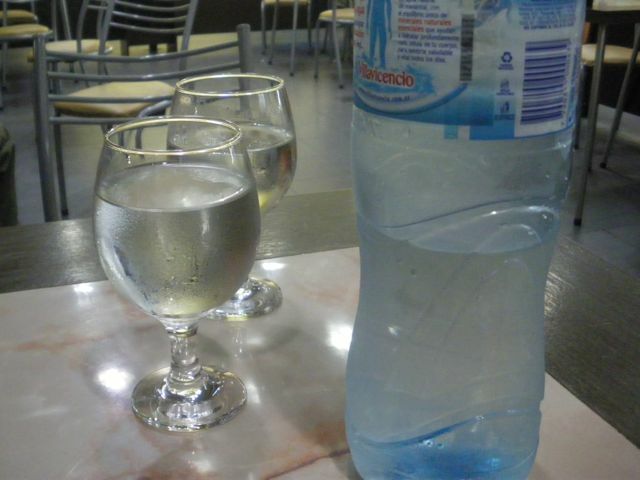 At some service stations agua con o sin gas is served in glass goblets. Parrilla. Grill. A place that serves asado, meaning practically any place with sit-down service and a waiter. Pan. Bread. Panaderia. Bakery. You can open a store that sells anything by adding –eria to the end of the thing you sell. A ferreteria, for example, sells ferrets, although they apparently also sell hardware. Pollo. Chicken. Grilled, or used to fill empanadas. Salado. Technically salty, but apparently anything not sweet. Vende. For sale. This has nothing to do with food, but if you see a car or truck with a water or pop bottle on the roof or hood it is for sale.